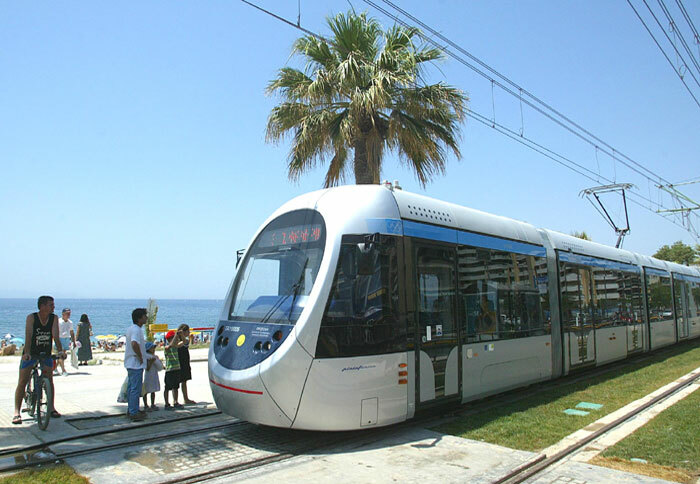 An electric tram carries us from the Faliro waterfront to Syntagma Square in about forty minutes. It is a short walk from the Syntagma station to the Ministry of Culture office, where we must present our credentials to obtain scholar passes. Since the official paperwork won’t be done for a few days, we walk back to Ermou street and find a kafenion where we can plan our day. After sipping an ellinikos (Greek coffee) we stroll down Ermou, a very commercial pedestrian street named for Hermes, the ancient god of commerce. The store displays offer little of interest, so we continue until we reach a place we haven’t visited in years: Kerameikos. This was the demosion sema (public cemetery) of ancient Athens. It was named after the community of potters (kerameis) in this part of the city (or after Keramos, the mythic lord of potters). 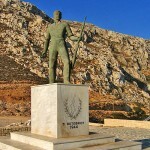 The defensive wall built by Themistocles in 478 BCE (after the Persian wars) split the Kerameikos district. Pottery shops were inside the wall near the agora (market), and the cemetery was outside the city gates. 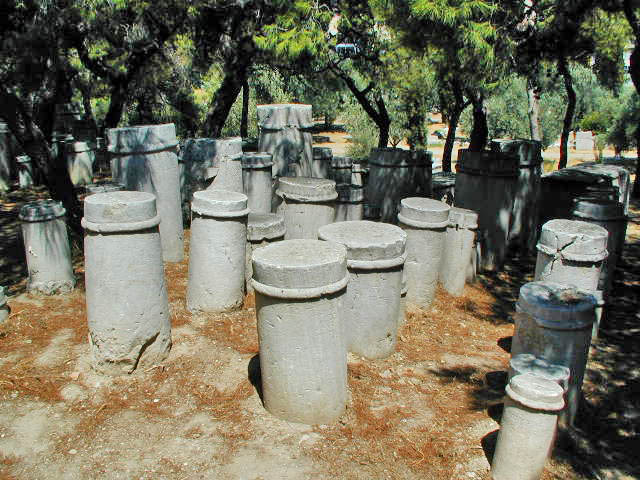 The first thing we see upon entering the site is a collection of what appear to be stone bollards in a pine grove by the little museum. These are simple grave-markers used after a law was passed to prohibit more elaborate monuments (statues, tombs and such), which had formerly been fashionable. As we walk into the old cemetery, it is easy to understand why the city might have passed such a law. Some monuments are quite large, and theke (repositories for the bones of soldiers who died in wars) were sizable buildings. 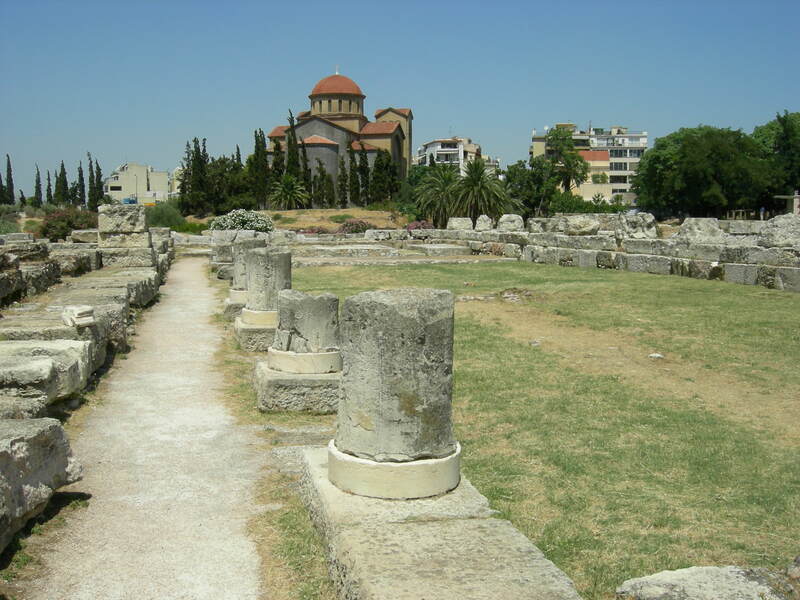 Athenians were buried at Kerameikos for more than a thousand years, so space was limited. Citizen, statesman, hero and villain – all were buried along the roads leading to the city’s main gates. 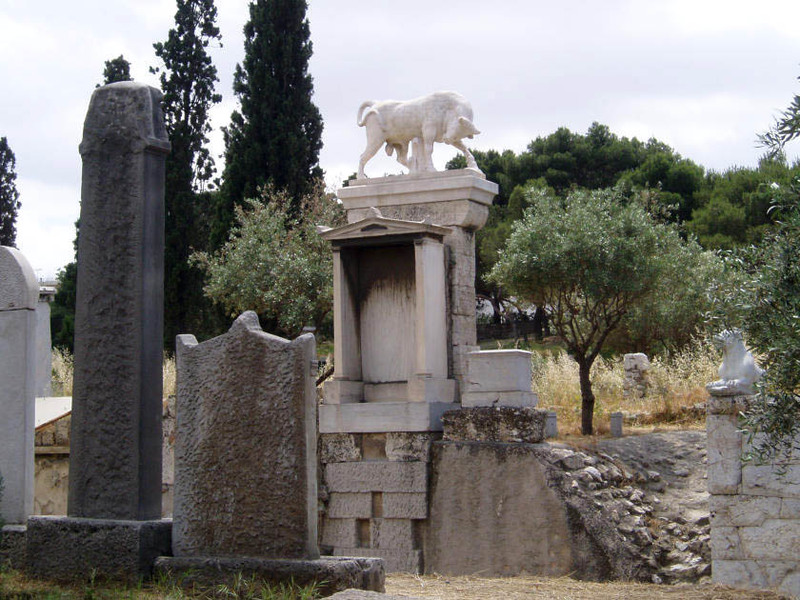 Here are the graves of such public figures as Solon and Kleisthenes, founders of Athenian democracy, the statesmen Ephialtes and Perikles, philosophers Zenon and Chrysippos, and generals Phormion, Thrasyboulos and Chabrias. 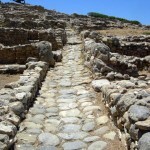 As we follow the ancient road to Athens, we come upon several sections of the old city wall. From these ruins it is difficult to picture the true dimensions of this impressive structure. It was 8 meters (26.2 feet) tall and 3 meters (9.8 feet) thick, with strong defensive towers at the gates – from which defenders could rain arrows down upon any invader. 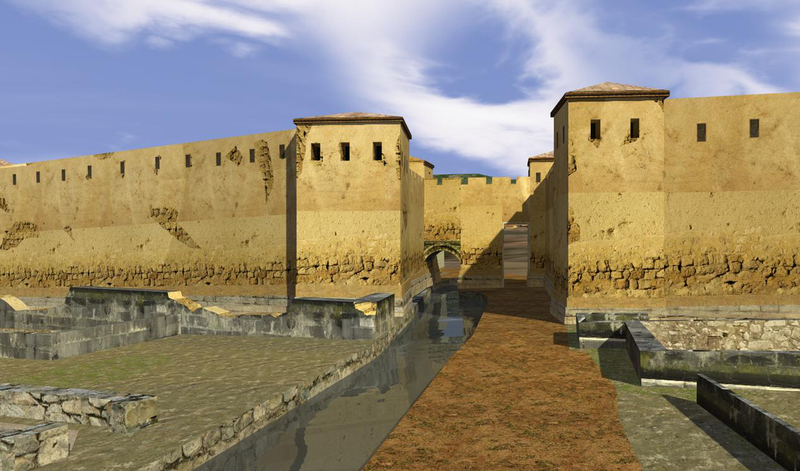 The river Eridanos flows out of the city through an arched channel at the Sacred Gate. The arch is still here among the ruins, and the river channel is clogged with bog plants. In ancient times it was a gushing winter torrent, coming down from the south slope of Lykavittos hill and eventually flowing into Ilissos river. 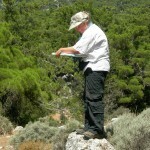 Nowadays, it is only a stream that mainly runs underground, except where it flows through Kerameikos. One of the most impressive buildings connected with these city gates is the Pompeion, which was used to prepare for the Panathenaic procession. 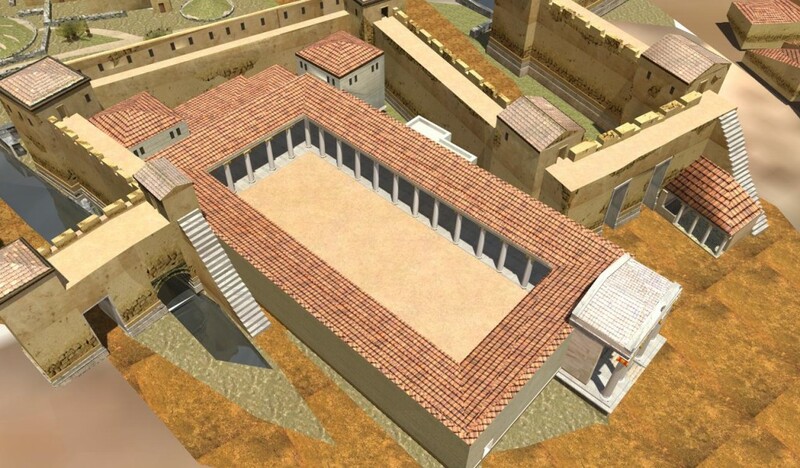 When it was first built (4th century BCE), it was a rectangular building with a propylon at the northeastern corner, a columned porch around a courtyard, and several adjoining rooms (perhaps for storage of religious items). To anyone arriving in ancient Athens for the first time, it must have seemed a fabulous building tucked between the two great city gates. 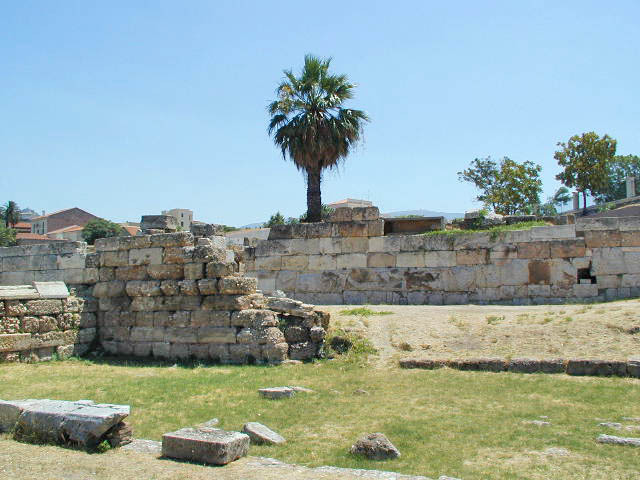 The Pompeion seems to have been destroyed in 86 BCE, after which potters established workshops and kilns among the ruins. 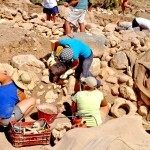 They were evicted by the Romans and another large building was constructed. It too was destroyed by invaders, and the ruins were again taken over by potters and their kilns. Why? 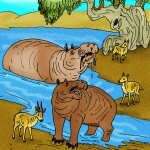 Because of the ready supply of clay in the Eridanos river bed. 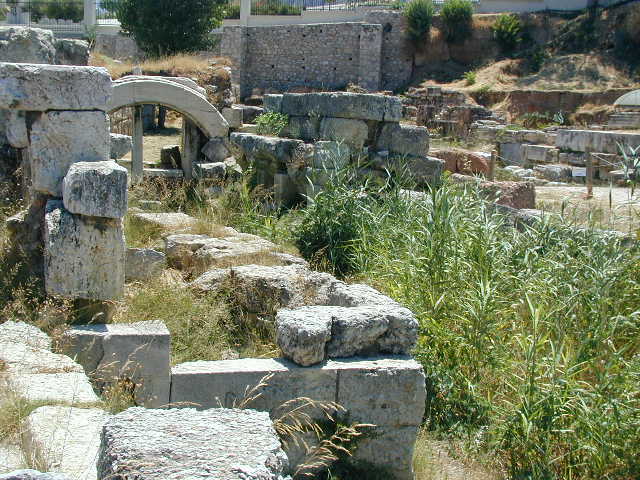 Kerameikos remained the domain of potters. Special thanks to Dimitrios Tsalkanis, who gave us permission to use his wonderful digital images. 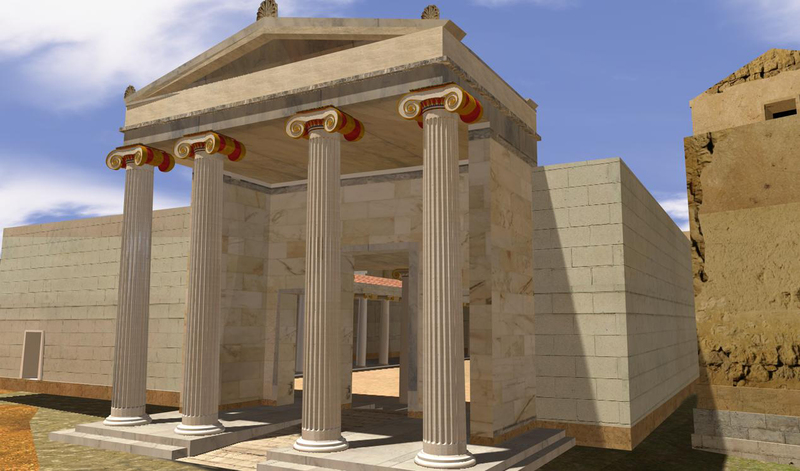 More can be found at Ancient Athens 3D. 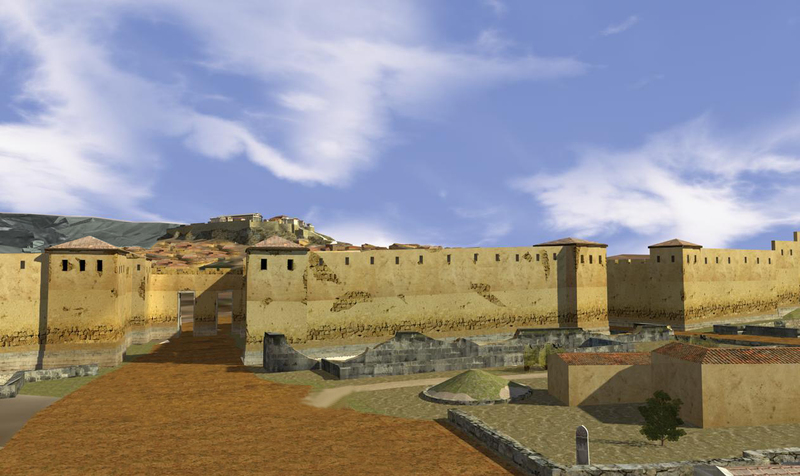 I stumbled across this article in my search for information on the defensive wall of Athens. I am impressed. I do not often discover a blog that is both informative and entertaining.